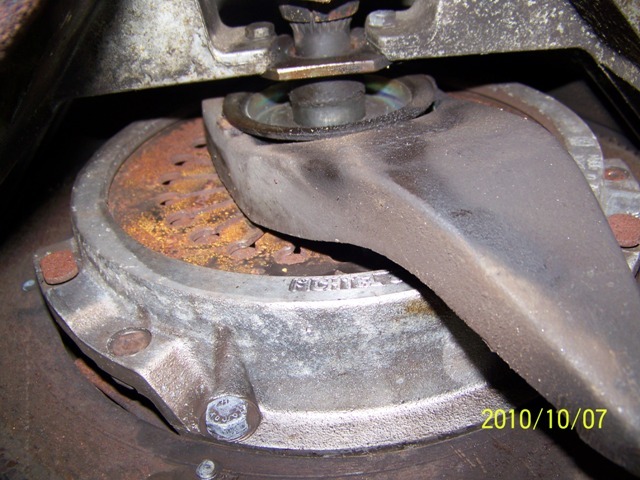 A maladjusted center plate will usually cause clutch drag, but will not lock up solidly. 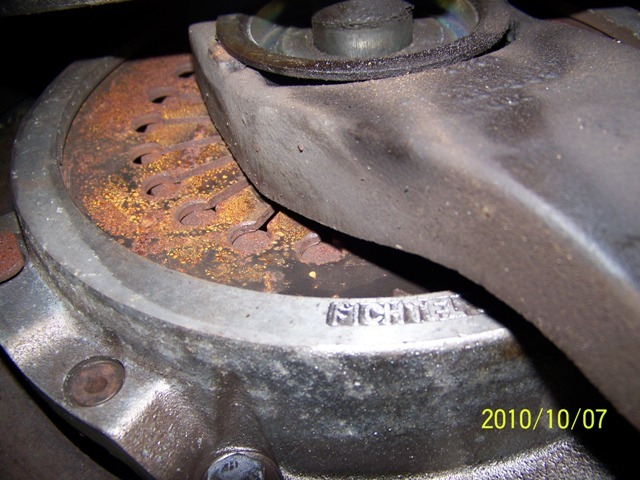 A stuck clutch plate will lock up solidly. Position the car so that there will be no damage or danger if the car lurches forward a few feet. Very securely chock the front wheels. Jack the rear wheels just off the ground, and securely support the car. Put the transmission in fifth gear. Push the clutch pedal to the floor and hold it there. Do not apply the foot brake or the parking brake. Crank the engine - the rear wheels will spin. Accelerate until the speedometer reads about 20 mph, then stab the brake pedal. If the engine stalls, repeat a couple of times. If the clutch doesn't break loose, its time to pull the bottom of the bell-housing and take a look. So I looked at the upper pivot ball and used a pry bar to push it back (slave still in stalled). The ball is intact and still threaded into the engine. The arm moves back with what i would judge to be pressure from the slave rod on the bottom end but there does not seem to be an insert holding the arm onto the ball. I would have expected it to be a snap on type fit but were it not for the slave being installed I would gues it would just slide off. Seems like I need the new insert and I assume I pull the slave to allow enough room clear the ball joint. Not sure this is the sole problem but looks like it needs to be taken care of to work down the list. That looks to be it. 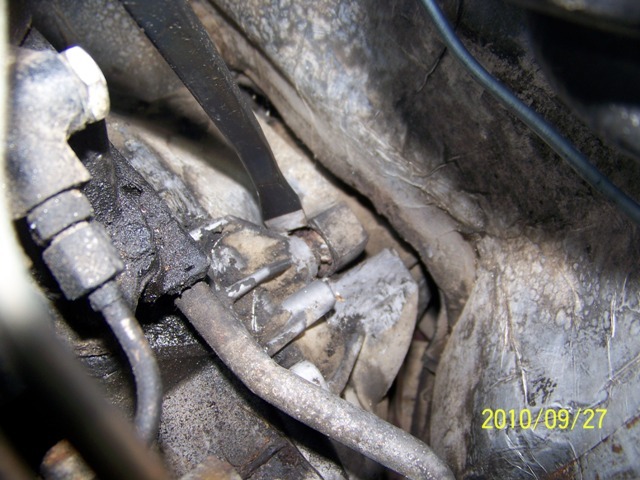 Fortunately, it is limited to stage 1 of failure as Stan indicated ..... so all you need is a ball socket bushing 928 116 145 03: sometimes, enough of the bushing remains to allow the release arm to function ...... poorly. That can be short lived, as the early version of the ball stud then fails. That happened on my '80 in the early '90's. I have a new release arm upper bushing coming in hopefully this weekend. I bleed the system again using the pressure bleeder from the top. The pedal seem to be soft the initial 1/2 " of travel and then hits some resistance. The soft area seemed to end aburptly like you were going past a stop so I started looking at the WSM and previous posts and looking at the pedal it self. WSM shows a clutch spring at the pedal. It states that the space between the spring plate and center of bolt is 43mm but pic shows that demension with the pedal at rest while verbiage seems to indicate measurement is pedal fully depressed. I have ~24mm at rest and ~29mm with pedal fully depressed. If I am reading the WSM correctly I need to turn the wing nut to copress the spring more to get 43mm with pedal fully depressed, correct? Again this is my first 928 so I have no feel experience to go by. What issues are created by not having the proper clutch spring setting? Is it only a pedal force issue? I still need to check rod preload but based on the diagram below the spring adjustment should not impact that setting. I don't know about those measurements but I have adjusted a few. Be careful about those instructions. They varied over time and models and I've had problems when pre-loading the rod. My suggestion is to adjust the rod until it is firm and then back off (loosen) it one turn. This ensures the master will fill from the reservoir. Maybe you have too much play there. Also note that you don't need to remove the clevis, just loosen the lock nut and turn the rod with your finger or small wrench. Also, your description of the pedal action is in-line with other 928s: free motion at first but not fully disengaged until it's almost to the floor. A long engagement angle, too. So ya press it and it goes down a bit easily then it gets firm and the clutch slowly opens and isn't fully open until it gets to almost the floor. I've been following along somewhat but have you dropped the clutch out and inspected everything? Might have clutch plates stuck on the intermediate shaft or wear there that prevents the plates from moving. I have not had the bell housing open yet. Working through the easy stuff first. I am trying to do one thing at a time and then verify results so I know at what point the issue is resolved understanding that it maybe a culmination of many items contributing to the current problem. Okay, release arm ball joint insert is replaced. System bleed, pedal firm and slave rod travels per WSM. 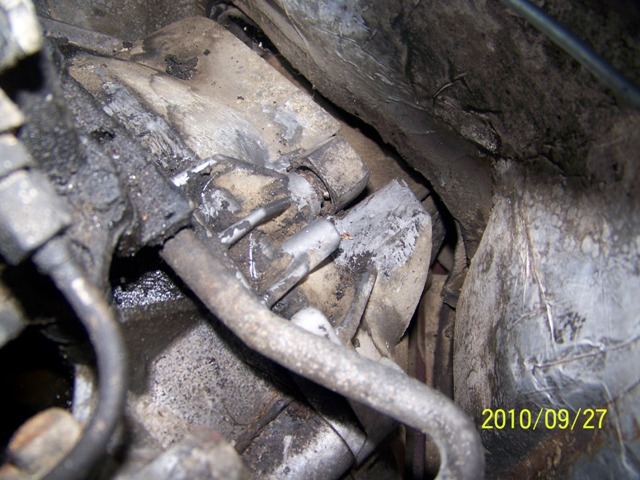 Still encounter grinding with engine running whenattempting to shift the car into reverse or 1st. I attepmted the suggested procedure today without the hoped for results. I jacked up the rear end to get the rear wheels just off the ground. Put the transmission into 5th depressed the clutch and started the car. Rear wheels were turning. I acceleratred until about 30MPH on speedo and then depressed the brake. Engine decelerated and then died accompanied by what sounded like an air brake releasing. I attempted this 5 times with the same result. With the engine running and clutch pedal depressed the wheels begin to turn as I attempt to pull the shifter into 4th or 5th gear but I get no grinding. I understand that slave rod travels the right distance. But is it the correct length? Then, you could hook-up a comealong to the acuator arm and try a little extra motion to actuate (not much). Beyond that confirmation, I'd pull bell housing, take it apart and measure. You've seen the long comparison of parts in the WSM during these years that the clutch/trans was being massaged. Worn actuating sleeve, discs frozen/corroded to intermediate splined shaft, discs stuck to flywheel and intermediate plate are possible. Also some wrong parts. I'd probably write-off those clutch discs and star soaking the biatch with penetrating oil. Just an amateur here, but that's what I'd do. "...then stab the brake pedal." The idea is to use the rotating inertia of the drive train and wheel assemblies to apply a sudden impact loading. "Depressing" the brake pedal implies a tentative application, which will have little or no effect. At this point, it would be better to pull the bell-housing lower cover and take a look. That should take thirty minutes or so, including jacking the car. Ah okay, there is a difference. I pressed and held the brake. I will try the stab approach a couple of times. I had the bell housing off inorder to get the release arm out of the way enough to replace the bushing. I have never worked with a clutch before so I am a deer in the headlights at this point. Not sure what to look at. Not sure if these photos are any help but at this point I am out of ideas and experience. Remove the lower cover from the bell-housing, exposing the clutch from below. Use a good flashlight or drop-light to examine the clutch. - The flywheel surface, bolted to the crankshaft and turning with the engine. - The forward clutch disk, squeezed between the flywheel surface and the front surface of the intermediate plate. The disk is splined to the clutch output shaft, which is bolted to the driveshaft inside the torque tube. - The intermediate plate, which is connected to the pressure plate, and thus driven by the crankshaft. - The rear clutch disk, squeezed between the rear surface of the intermediate plate and the pressure plate. This disk is splined to the output shaft, thus also bolted to the driveshaft inside the torque tube. - The pressure plate, which is a heavy metal ring inside the stamped metal cover. The ring is strongly spring-loaded to clamp the two clutch disks and intermediate plate against the flywheel. The ring is pulled away by the release bearing, removing the clamping pressure. When the clutch pedal is all the way up, the pressure plate is heavily spring-loaded against the rear clutch disk, thus tightly clamping the front clutch plate, the intermediate plate and the rear clutch disk between the flywheel and the pressure plate. The friction makes all parts turn together, driving the output shaft with the crankshaft. 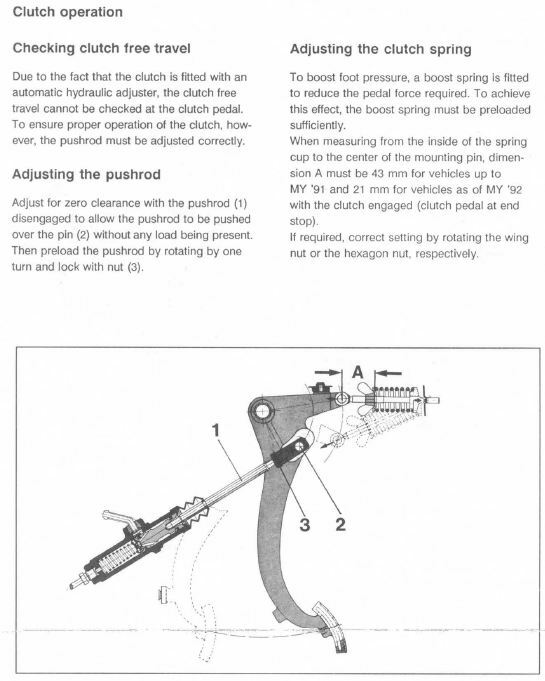 When the clutch pedal is all the way down, the pressure plate pulls back, removing the clamping pressure, allowing the two clutch disks to float freely between the clamping surfaces, freeing the output shaft from the crankshaft/intermediate plate/pressure plate assembly, allowing the crankshaft to rotate without driving the output shaft. What you are looking for is one or two of the clutch disk surfaces being rusted to one or two of the metal friction surfaces, OR you are looking for insufficient rearward movement of the pressure plate to release the clamping force on the clutch disks. When the release arm pulls the throwout bearing against the pressure plate fingers (the segmented metal disk in the center), the fingers move the pressure plate to the rear, pulling it away from the rear clutch disk. The rear clutch disk should slip back slightly, so that it floats freely between the pressure plate and the intermediate plate, transmitting no torque. The removal of pressure should allow the intermediate plate to also move back slightly, releasing the pressure from the forward clutch disk. The release of pressure on the forward disk should allow it to slip slightly to the rear, so that it floats freely between the intermediate plate and the flywheel, transmitting no torque. When I originally purchased my 87 928 5 speed I had the exact problem after the slave cylinder was replaced. The sound of the tech grinding the gears was not good to say the least. I contacted a friend who is very good on 944's and 928's. We put my car on a lift and ten minutes later he had the problem solved. Send me a PM and I will forward you his contact information. Even though it has been a few years he will remember working on my car. I dropped the bell housing and used a ratchet strap to hold the release arm back per a recommednation from Mark Robinson. I adjusted the h's/t's all the way back and the discs were still stuck to the plates. I added some tension and pulled the release arm back further and then used a flat tip screw driver to gently free the discs. Thanks all for the help and advise. Your diagnosis was spot on!!! !